To reserve your place, contact Elena Greco by email. THE MUSIC SALON™ provides an audience and community of fellow creative artists who enjoy coming together in a supportive space to make music! We welcome musicians of any instrument or genre, but are particularly supportive of the needs of singers. Come to make music, nosh and enjoy the company of other creative artists. I began the Salon eight years ago because I wanted to provide a place for performers to perform for each other in a relaxed setting that promotes creativity. Also, as I mention at the start of every Salon, I want to provide a place for community, something that is often difficult to find in the performing world. We always have a terrific, highly-skilled and experienced accompanist assisting us, one who can sight read anything you choose to bring and who is aligned with the purpose of THE MUSIC SALON™. We meet on the Upper West Side of Manhattan every first Sunday of the month (except when it falls on a holiday, when we do it the following Sunday). The Music Salon is open to vocalists and instrumentalists of any genre; poets and lyricists are welcome to read their work, as well. It’s fine to run audition pieces when you’re getting ready for a big audition, and it’s equally fine to experiment with pieces you’re not sure about or that are a departure from your usual genre or style. It is not open to the public or to spectators in order to maintain a safe and comfortable space for the creative artists. If you are interested in joining us, or know of someone who might be, you are warmly invited to let me know by emailing me. Most months THE MUSIC SALON provides a performance opportunity. Several months during the year, the Salon offers workshops or master classes that serve and engage us as creative artists, offering information, experience, healing or insight in the space of our musical community. See below for related links, and see more at THE MUSIC SALON. Come join us, and have a great time singing, noshing and networking! The image is “St. 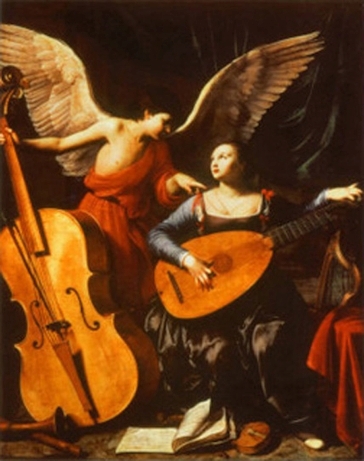 Cecilia and the Angel” by Carlo Saraceni (Italian Baroque).